The ongoing Panya Project started in August of 2006 in Mae Taeng, Chiang Mai. Project heads envisioned a sustainable model of living for different environments (wet and dry climates) that incorporated educational holistic programs. The project area comprises four hectares in the northern part of the the country, situated between a national forest and traditional village farms. Proposed in the year 2002, the project was funded with an initial capital of $48,000. It became self-sufficient in two years through natural building and Permaculture Design courses(PDC). - additional educational center for international green living and SE Asian cause-oriented advocates. At present, Panya Project plans production gardens, aquaculture ponds and a new food forest (with over 30 fruit varieties). Successful as a fundraising tool, educational courses provided the infrastructure of Panya as well as the platform for learning and sharing. The first course, taught by Loong Yoot and Geoff Lawton included 30 participants, a mixture of project community members, local and international students. Today, courses are run by Christian Shearer, Chris Shanks, Cam Wilson, Ethan Roland and Melissa Breed. Latest co-teachers are community members living at the project site. Christian Shearer also offers consultation and conducts PDC around Asia. Panya’s 2-million liter dam and water-harvesting system was built with the initial PDC course design. The aim was to build and maintain a self-sufficient water system for dry and hot climates. Infrastructure at the project site uses eco-friendly materials that are locally sourced. Adobe buildings are made through the cob and wattle method from the Pun Pun Educational Center. It involves stick frames, as well as earth materials for brick making. Other building materials are bamboo, eucalyptus wood and recycled materials. The project site now also houses two bungalow huts and a learning space for teaching, cooking and dining. An office and library is also nearby. A steam sauna (heated by methane digestion) was planned for 2008. Panya Project’s food forest is a former mango plantation that is envisioned to expand with more fruit varieties. In 2007, banana, passion fruit, papaya, coconut, jackfruit, Jamaican cherry and many others were planted. An added food source is a vegetable/herb garden near the kitchen, which is hoped to be turned into a commercial organic garden one day. The area is also home to several aquatic and domestic animals. They provide food, food recycling, fertilizer and grass management as well as composting benefits. Panya Project members not only work hard for the environment and the community but also aim for personal development. The community interacts in supportive ways to enhance physical, emotional, intellectual and spiritual well-being. Healthy exercise, mediation and reflection are encouraged along with established wisdom tradition and practices. Regular activities throughout the year are divided between wet and dry seasons. During November until May, dry month programs are devoted to conducting courses, earthbuilding and vegetation. For the wet season between June to October, activities are focused on mulching, planting and earthmoving. From its launch until 2010 plans include expanding infrastructure, educational courses, consultation and outreach. The project community is still looking to refine established systems and research new ways to improve them. The Panya community still needs more people with certain skills to further maintain its projects. These could be something as simple as cheese making skills to something more challenging like engineering know-how for a methane digester. 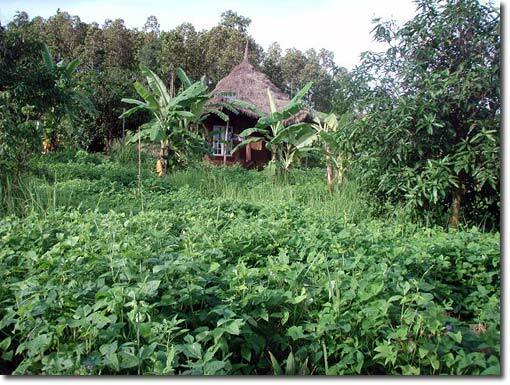 This entry was posted on Thursday, May 20th, 2010 at 11:14 am	and is filed under Permaculture Courses, Thailand projects, Volunteer Opportunities. You can follow any responses to this entry through the RSS 2.0 feed. You can leave a response, or trackback from your own site.